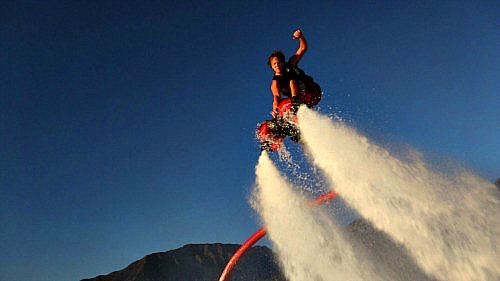 The Flyboard, a new extreme sport phenomenon, is a personal watercraft (PWC) accessory that uses the PWC’s thrust to propel the rider up to 45 feet in the air or allow him to dive below the water like a porpoise. An experienced rider can do twists, turns, spins, front and back flips and even loops. 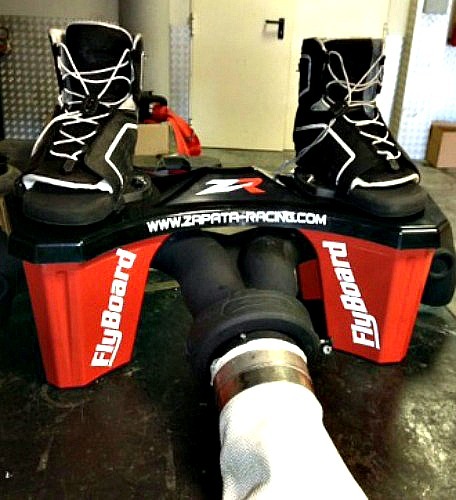 This innovative PWC accessory is an ingenious combination of a pair of wakeboard-style boots attached to a molded-plastic-board connected to the jet unit of a PWC with a 55 foot hose. Water pressure created from the PWC is redirected through the hose to an intake manifold centered beneath the board with a port leading to each side and terminating in a downward pointing nozzle. It is this redirected water pressure from the PWC which creates the lift. A detachable rotating main bearing located between the end of the hose and the board allows the rider to spin freely around the hose. The board can be attached to almost any PWC with of least 100 HP, although ideally it should have 130 HP or greater. The greater the horsepower, the greater the water thrust delivered to the board which translates into greater height and speed. The standard kit comes complete with board, manifold, wakeboard-style boots, 55 foot hose with a rotating main bearing and a 180° elbow which reverses the PWC water outlet. Everything needed to get you flying in just a few minutes. A separate PWC Adapter Kit is required to connect the board with your PWC. The kind of adaptor is dependent upon the type of PWC you have. A PWC is still needed to provide thrust to the board, but an operator is not required. Essentially, the unmanned PWC trails along behind the board while the rider surfs through the air. The kit can be purchased with two arm hoses and handle nozzles which attach to the rider’s arms with Velcro. These aid in stabilizing the rider, similar to ski poles, and may be a beneficial addition for the novice flyer. With all attachments, the board weighs approximately 95 pounds, but don’t equate it with having your feet in a bucket of concrete. Due to the built-in buoyancy, the board floats on the water, so the rider is never in jeopardy of sinking to the bottom of the lake or river. 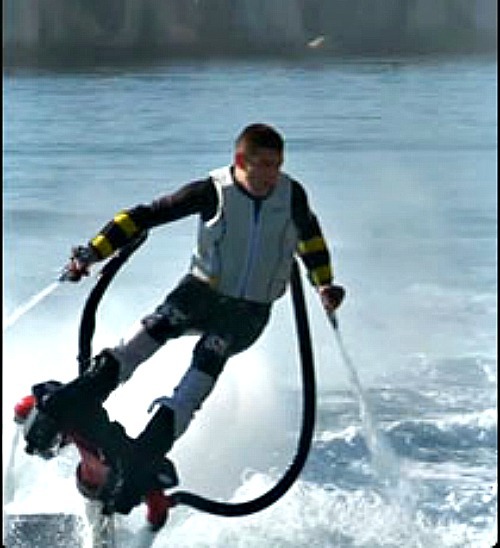 Like any water sport, Flyboarding carries with it an inherent risk. Having said that, however, it can only be as safe or as dangerous as you make it. All riders are encouraged to wear a US Coast Guard approved personal flotation device, wakeboard helmet and isothermal pants. Everyone who purchases this PWC accessory must complete an Operation Safety Course which will teach you the basic skills needed to take flight and fly safely. In August 2013, Blaine Jeffery launched Flyboard Magazine dedicated to this extreme sport. This is an E-Zine with articles on flying, competitions, professional profiles and more. To examine this magazine, Click Here. This innovative idea is the brainchild of Franky Zapata, a multiple World and European champion and probably the best jetski racer in the world. 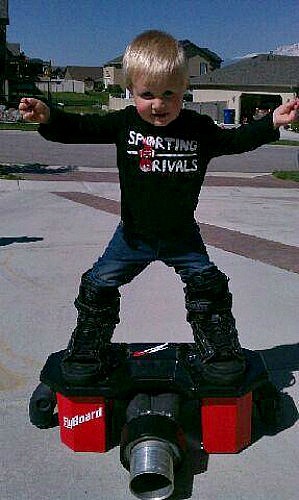 Franky designed, built and raced his own jetskis under the brand name of Zapata Racing. In the spring of 2011, Franky and his team at Zapata Racing, began experimenting with this novel prototype PWC accessory. They applied for, and were granted, a patent by the French Institut national de la propriété industrielle (INPI). Zapata and his team introduced the board at the Jet Ski World Championship 2012 in China. 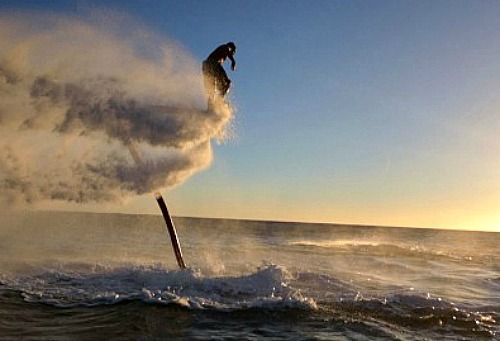 The first Flyboard World Championships took place in Doha, Qatar in October 2012. Today, a year later, there are dealers and distributors in many parts of the world: Africa, Central and South America, North America and South East Asia to name just a few. A special thanks to Thom Hall and Rocky Mountain Flyboard for allowing me to use the images found on this page. 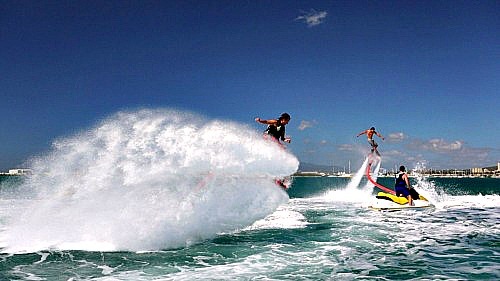 They are the exclusive Zapata Racing Flyboard Dealer for Utah, Montana, Wyoming, Colorado, Idaho, Washington, Oregon, New Mexico, Hawaii & Guam.